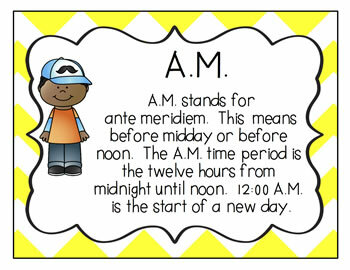 Key Difference: AM stands for ante meridiem, which means before midday, while PM stands for post meridiem, which meansafter midday. Hence, from 12:00 (midnight) to 12:00 (noon), the time is written as AM, while from 12:00 (noon) to 12:00 (midnight) is written as PM. The first thing we learn about time is that there are 24 hours in the day. Each hour is then divided into 60 minutes, each of those minutes then stands for 60 seconds. The 24 hour day is divided into two 12-hour segments for our convenience. These 12-hour segments are called AM and PM. 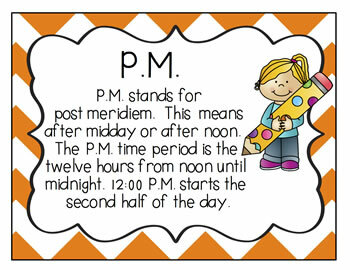 AM stands for ante meridiem, while PM stands for post meridiem. The term ‘meridiem’ is Latin, which stands for ‘midday’. Whereas ‘ante’ means ‘before, and ‘post’ means after. Hence, ante meridiem, i.e. AM literally mean before noon, while post meridiem, i.e. PM means after midday. This time differentiation is not really a new phenomenon. The 12-hour clock was in development since the mid-second millennium BC. Over the past 4000 odd years, the clock has been fine tuned and eventually came to be in its current form in 16th century AD. The day actually begins at midnight, i.e. 00:00 as it is known in the 24 hour clock. In the 12 hour clock, this becomes 12:00 am. The first 12 hours of the day start from 12:00 midnight, to 12:00 midday, which we call 12:00 pm. The second 12 hour cycle starts from 12:00 to the end of the day, which is midnight also known as 12:00 am. Hence, from 12:00 (midnight) to 12:00 (noon), the time is written as AM, while from 12:00 (noon) to 12:00 (midnight) is written as PM. The 12 hour cycle came through the day/night. Historically, the first 12 hours occurred during the day, where the time was kept using the shadow of the sun. The second half of the day occurred at night when the time was kept using the position of the moon and stars. This is also why many people today think that AM is when it is light outside, while PM is when it is dark outside. However, this is not the case, mainly because as our ancestors figured out it is not light outside for 12 hours, similarly nor is it dark for 12 hours proper. Depending on where you live, more hours of the day may have light, or more hours of the day may have dark. There are places near the poles where it is light for all 24 hours of the day, or darkness for all 24 hours of the day.